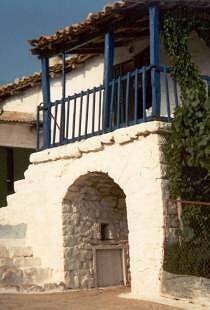 The traditional rural architecture of Stephani is the expression of the creative effort of countless generations of stone craftsmanship, that built houses and churches, watermills, fountains and dry stone walls- buildings harmonically integrated in the environment that today represent the most important part of the cultural heritage of our region. Rural heritage today constitutes not only one of the most authentic components of Greek and European culture but represents also a major factor of local development. Stephani is still comprised of a large number of homes that are excellent examples of 18th to early 20th century Peloponnesian architecture. In the last decades however changing patterns of agricultural production and social transformation, especially urbanism, have endangered the very existence of the traditional rural architecture of Stephani and its setting. The lack of respect and of knowledge regarding the value of rural architecture as well as uncontrolled development of buildings are gradually destroying the harmony of the landscape resulting in the loss not only of the buildings themselves but of local identity. Until today the local authorities of the region have failed to give thorough consideration to the negative effects of the deterioration of rural heritage on socio-economic life and regional balance and to take account of both built and natural heritage when framing their policies for development. The incorporation of the protection of the built heritage into the planning, regional development and environmental protection process should be seen as an essential factor for the future of the region. Therefore identifying the rural heritage on a multi-disciplinary basis that embraces architectural qualities as well as geographical, historical, economical, and social factors and publishing the material is vital in order to promote understanding and to alert the general public, owners and farmers to the riches of the rural heritage and the reasons for wanting to preserve it. Local authorities should develop firmly based systems of incentives, advisory services and architectural assistance in order to encourage the re-use of existing buildings, however humble they are, by seeking to adapt them to new purposes while conserving as much of their original character as possible and to promote a contemporary local architecture with a creative approach based on the lessons and the spirit of traditional architecture. This website aims to promote knowledge on the rural architectural heritage of Stephani in order to contribute to its preservation and protection.